Democratic lawmakers say they can make political hay of the battle over net neutrality among a small — but committed — group of midterm voters. Why it matters: The linchpin of that strategy is a vote in the Senate Wednesday on a measure to undo the Federal Communications Commission’s 2017 repeal of net neutrality rules. That raises the prominence of the effort to preserve the neutrality rules — and will put at least some Republicans on record as opposing it. For everyone else, Democrats can still use net neutrality to make a broader point. “This should be viewed as another plank in the broader Republican platform, along with their toxic health care agenda, where the GOP is using their total control of Washington to make life more expensive for the middle class in order to benefit the special interests they care about,” said David Bergstein, a spokesman for the Democratic Senatorial Campaign Committee. 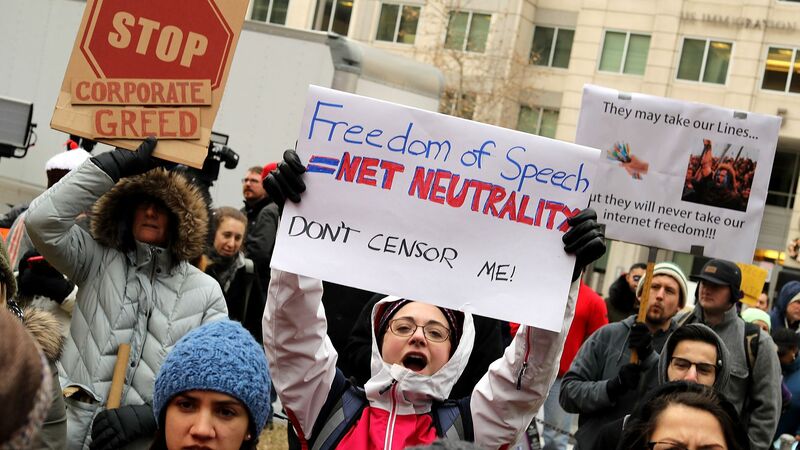 This strategy is already playing out ahead of Wednesday’s vote on a resolution that rolls back the FCC's repeal of net neutrality rules that banned internet providers from blocking or slowing down content, or speeding its delivery up for a fee. The DSCC is running short digital ads to get support for its effort. Under the FCC's repeal, current net neutrality rules end June 11. Our thought bubble: Sure, Democrats know there are voters who agree with them on net neutrality. The open question is how many of those voters care about it enough to let it drive their behavior come Election Day. Go deeper: Read Axios's rundown on what to watch after the net neutrality rules are gone.